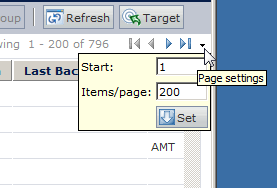 Use Page settings to set display preferences for pages listing devices or displaying graphics. This does not include the health dashboard, which contains separate dialog boxes for setting display preferences. In the Web console toolbox, click Administration > Preferences. Click the Page settings tab. In the Graph type list, select the type of graph you want to display in Reports. In the Items/page box, type the maximum number of items you want to display in each page that uses pagination (the maximum allowed value is 500). To show text alongside the buttons on toolbars, select the Show text on toolbars check box. To ensure that the Web session you are running to view the Web console does not time out, select Always keep Web session alive. NOTE: You can show text alongside the buttons on toolbars, thus helping new users with feature identification. If this option is not selected, only icons appear on the toolbars. However, the icons display text when the mouse pointer hovers on them. While viewing any list of devices, click the down arrow at the far right (under the toolbar) to open the Page Settings box. Type a number in the Items/page box (maximum 500). To begin the list later than the first record, change the number in the Start box. Your changes are valid only while you work in the current list. If you change to another device list, the number of devices displayed reverts to the setting in effect on the Page settings tab.